Discover a place where adventures are made, pristine shores are abundant and nature is close at hand. Lose the traffic, the city noise and the crowd, and discover the perfect vacation or new place to call home. Witness nesting sea turtles, beautiful sunrises, and warm, breezy weather. Includes Cities/Towns: Cape Canaveral, Cocoa Beach, Rockledge. Just minutes from Cocoa Beach, you’ll find Port Canaveral Cruises, Kennedy Space Center, BCC Planetarium & Observatory, Historic Cocoa Village, Brevard Zoo, Duran Golf Club and many other area attractions. 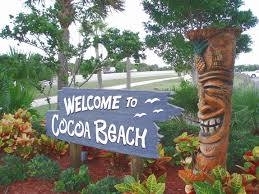 Easy to get to from just about anywhere, Cocoa Beach is less than an hour from the Orlando International Airport (MCO) and is a 45-minute drive from the Melbourne International Airport (MLB). Cape Canaveral Hospital is a local, well known medical facility. Jan 49.3 F° 60.0 F° 70.8 F° 2.4 "
Feb 52.3 F° 62.9 F° 73.5 F° 2.7 "
Mar 55.5 F° 66.3 F° 77.0 F° 3.4 "
Apr 60.5 F° 70.8 F° 81.0 F° 2.3 "
May 67.3 F° 76.6 F° 86.0 F° 3.2 "
Jun 72.3 F° 80.8 F° 89.3 F° 6.7 "
Jul 73.3 F° 82.3 F° 91.3 F° 6.2 "
Aug 73.5 F° 82.3 F° 91.0 F° 7.7 "
Sep 73.3 F° 80.8 F° 88.3 F° 7.5 "
Oct 68.0 F° 76.0 F° 84.0 F° 5.0 "
Nov 60.3 F° 69.5 F° 78.8 F° 2.9 "
Dec 53.3 F° 63.0 F° 72.8 F° 2.6 "
Spring temperatures are mild with averages in the low 70's and highs in the low 80's. Nights are cool with lows in the low 60's. Summer temperatures are warm with averages in the low 80's and highs in the low 90's. Nights are mild with lows in the low 70's. Fall temperatures are warm with averages in the mid 70's and highs in the low 80's. Nights are mild with lows in the upper 60's. Winter temperatures are cool with averages in the low 60's and highs in the low 70's. Nights are cool with lows in the low 50's. Volunteers are always needed at our Tourist Information Center and various other places throughout the county!